Socialization is one of the number one things to do when a new puppy comes into your household. Teaching your dog to be dog-friendly and human-friendly is a crucial aspect of raising your furry companion. This helps your dog become a happy, healthy, and well-behaved member of your family. It is hardly possible to underestimate the importance of proper socialization, because how you care for your dog plays a big role in how it responds to people and other canines. Three weeks to three-four months is a critical age in socializing your puppy. This is the period of forming the puppy's behaviour. For this reason, it is important to find a breeder who takes time to socialize their puppies. If a puppy has been well-socialized in its first months of life, chances are it will be calm, confident, relaxed, and friendly dog. Puppies who aren't socialized can grow up to be fearful of other dogs, people, and just about anyone and anything outside of their routine. That fear can lead to aggression. If you get a dog that has not been properly socialized, do not despair. For a dog, life is all about the moment, and you can at any time change the way it views its surroundings. Of course, it will require more time and patience than with a young puppy, but it is surely worth it because it will help both you and your dog become happier. You'll have to move slowly and cautiously, and if you see signs of aggression or extreme timidity, get help from a professional trainer or behaviourist. How do I socialize my puppy or dog? Don't take a puppy away from its mother and littermates before eight weeks of age. Interactions with their moms and siblings teach young puppy a lot about getting along with other dogs. If a puppy is taken away from his canine family too early, it will do heavy damage to his social skills. Expose the puppy to new people, places, and situations in a positive way. Take it to obedience classes, dog park romps (as soon as it has got all the necessary shots), and playdates with your friends' dogs (as long as they are not aggressive). Introduce it to all types of sights and sounds, like skateboards, bicycles, lawn mowers, vacuum cleaners, dishwashers, and so on. Give your dog plenty of happy experiences with all kinds of people. Big kids, little kids, running-skipping-yelling kids, tall men in boots, round women in hats, and people of every shape, color, and size. Teach your children to respect the puppy, and teach your puppy to respect your children. Consistent gentle grooming is an important technique to use. It familiarizes your dog with handling, especially of the ears, tail and paws, and it also creates a bond with you. Make a habit of brushing your puppy daily with whatever grooming tool is most appropriate for your dog's coat. Be gentle and make the whole experience pleasant and enjoyable. Introduce the puppy to bathing, nail clipping or filing, and brushing its teeth. Another positive side of this is good hygiene, which means a clean, odour-free dog. Always reinforce good behaviour with a reward like a praise or a treat. Give the dog positive attention when it does something you desire, so the dog links the action with a lot of pleasant experience, and is therefore encouraged to repeat this behaviour in the future. Always correct your puppy if it shows any signs of dominance or aggression toward another animal or person. You should NEVER tolerate growling, even if you're dealing with a small dog. Growling doesn't lead to anything good, and it is often a sign that your dog thinks it is the pack leader. Do not pet the dog when it is in an unstable state of mind such as anxiety, over-excitement, aggression, fear, and so on. You will only reinforce the negative behaviour if you do this. 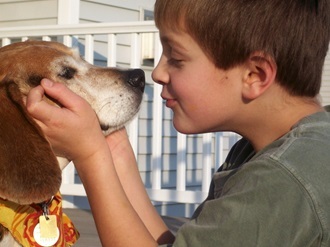 To learn more about this, read the following article: Things Every Dog Owner Should Know. To achieve the best results, dog socialization must be done with patience and repetition. No dog is born with full knowledge about how to walk on a leash, come when called or control its desires to bark and run. Taking the time to gently handle and train your dog gives it confidence and reinforces the good behaviour you want. When do I stop socializing my puppy or dog? It is a process that should never stop. A dog that had good social experience during puppy-hood can become less friendly over time if it is isolated or neglected during adulthood. Socializing is not something you start and end. It is something that should always be taking place, most importantly in the first months of your dog's life. Teaching your pup to be dog and people friendly is your most important job as a dog owner. It keeps people around your dog safe, and it also keeps your dog safe and happy.